Oregon is one of the most welcoming states in the country for incoming refugees, a new study says. The International Rescue Committee (IRC) and search site ABODO released research Wednesday revealing which U.S. states are most welcoming toward refugees, based on Twitter posts. Researchers analyzed dialogue on Twitter, including hashtags such as #RefugeesWelcome and #OpenBorders, to reveal positive and negative sentiments occurring at the state level. The new findings indicate Americans are more welcoming towards refugees than some might think, according to a recent IRC press release. “Now that we know officially who our two candidates are for president, it is important that both know where Americans stand when it comes to their views on refugees,” said Jennifer Sime, IRC’s senior vice president of U.S. programs, in a statement. The research found positive sentiment is not confined to any one region in the United States, according to the release, but rather is expressed throughout the country. The five states showing the most positive sentiments toward refugees were Washington, Maine, Utah, Kansas and New Hampshire. The states with the least positive sentiments toward refugees were Mississippi, Arkansas, Wyoming, New Mexico and Alaska; however, no state earned a negative score, signaling support for refugees is strong even in those states with lower scores. 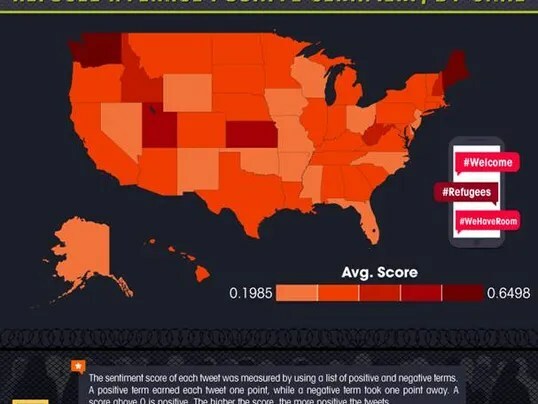 Oregon was in the top ten states for the most refugee tweets per 100,000, as well as in the top ten states for most positive refugee tweets by state. Refugees coming to Oregon have previously resettled primarily in Portland, but earlier this year, organizations including Catholic Charities Oregon announced the resettlement efforts happening in Salem. Between February and September, about 60 refugees are being resettled in Salem. To read the full report, go to www.abodo.com/blog/tweeting-about-refugees/. Currently, the most common refugee groups arriving in Oregon are from, Cuba, Burma, Bhutan, Iran, Iraq, and Somalia.